Here you will find vacancies from companies from Kiev, Dnipro, Kharkov, Odessa, Lviv, Zaporozhye and other cities of Ukraine. How it works: you post a resume, in a few clicks find suitable vacancies, contact employers and get job offers. 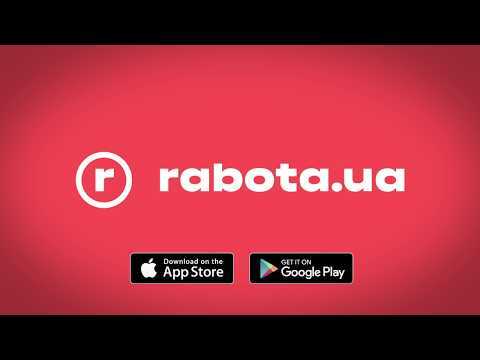 Use the improved search on rabota.ua! Wherever you are, job search is always at hand - browse jobs, respond to the most interesting ones and monitor the status of your responses using the mobile application rabota.ua. Look for work on the name of the profession, keywords or heading - we updated the search, improved the filters and simplified the use of tools. View jobs in an improved format. Also respond to similar and recommended job offers. Using the new functionality, you will be able to make the most of all the designer's abilities: quickly create and post your resume. And also at any time to quickly change the profile settings. Get daily notifications with new job offers so you do not miss a suitable job and respond first! All your actions are fully synchronized with the account on your computer or laptop. rabota.ua - your search for opportunities for development. - Added the ability to confirm the phone number that you specify in the resume. According to our data, employers often call to verified numbers. - Added the ability to view the vacancy on the map directly in the application. Now you can see where the office of the company you are interested in is on the job page! - Improved the work of filters when searching for vacancies. Finding suitable offers will be more convenient. - Optimized the work of the application and fixed minor errors in order to use rabota.ua it became easier and more pleasant. - A new feature: notifications about statistics for viewing resumes by interested companies. Now you will receive more relevant information about which employer was interested in your candidacy! Thanks for using rabota.ua! We are constantly working on improvements for you, periodically updating the application. Each update includes the launch of new features, improved speed and ease of use of the application. Thank you for using rabota.ua! We constantly work on improvements for you, periodically updating the application. Each update includes the launch of new features, improving the speed and ease of use of the application. Each update includes the launch of new features, improving the speed and ease of use of the application. In this version we have improved the process of creating a resume, also corrected the problem with the visibility of resumes for companies!